One of the final 6C 1750s produced, this sixth series example was delivered as a rolling chassis to Joseph Figoni's workshop in Paris. The Italian-born master coach-builder clothed the Alfa Romeo with one of his first 'teardrop' designs. 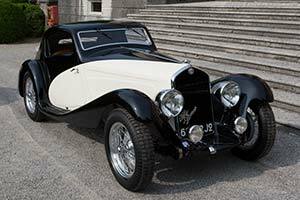 Finished in a two-tone black and white paint-job, the car 6C 1750 Gran Sport Figoni Coupe was shown at the 1933 Paris Motor Show on the Alfa Romeo display. It was subsequently awarded with a 'Prix d'Honneur' at both the Monte Carlo and Nice concours d'elegance in 1934. The unique machine was later also shown in Deauville. Its French owner had completely different plans for car the following season and replaced the streamlined coupe body with a lightweight open body to go racing. The only thing element left from the original design was the front valence panel. Driven by Guy Don and Jean Desvignes, the 6C 1750 Gran Sport finished an impressive sixth overall and first in class at Le Mans. Once the car's racing career was over, the original body was re-fitted. It is believed that later in the decade the Figoni Alfa Romeo was acquired by South African George Elkin. He used the car both on the Cote d'Azur and in Johannesburg during the respective summers. In 1968 the car changed hands, while remaining in South Africa. As a young man, the current owner often saw the car on the streets of Johannesburg while riding to school on his bicycle. It was the start of a love affair but it would eventually take until 2008 before he finally convinced the previous custodian to sell him the Figoni Coupe. Now painted a two-tone blue, the car had been subjected to a hasty restoration with many corners cut with the help of excessive amounts of filler and even fibreglass. It was quickly decided that a complete body-off restoration was required to return the one-off to its former glory. RX Autoworks of Vancouver was called in to tackle the project. With the help of historian Simon Moore, the car's history was pieced together. Pictures from both the Paris Salon and the two concours d'elegance were unearthed. On the frame and front valence panel the blue paint was found, which the car sported at Le Mans. Carefully preserving as many original bits as possible, the car was gradually put back together. Among the original elements saved were small sections of the blue paint and a to-do list left inside the seat during the original construction of the car. The extensive work was finally completed early in 2012. Soon after the 6C 1750 Gran Sport Figoni Coupe was ready, it made its post-restoration debut at the Concorso d'Eleganza Villa d'Este, where it won all the major silverware. The Alfa Romeo will later this year be shown at Pebble Beach before the owner will start using it on the road.